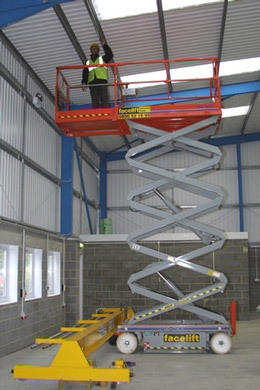 Facelift has made its second major investment for 2005 into the scissor lift sector with the purchase of 30 machines from Canadian supplier Skyjack. The order comprised of three models from the SJ111 series of electric scissors, ten of the 3219, with 7.6m working heights, ten 3226 units at 9.7metres and ten of the 4632 types with working heights of up to 11.6 metres. With safety as the main consideration, when working at height, the pothole protection feature gives greater peace of mind for the operator. With multiple applications, whether internal or external the Skyjack has shown its reliability on site. Commenting on the purchase Facelift Operations Director Frank Page said ?We are simply responding to our customers needs, which brings our total scissor lift fleet up to eighty?.